The carpets smell. Worked out that the t towels in the room smelled too. I think the carpets need replaced. Everything else was nice and clean. Loved the location. Beautiful walk along the river. 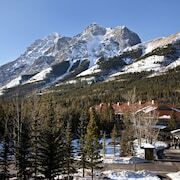 Where to find Bragg Creek hotels near an airport? 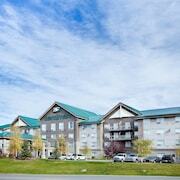 Where can I find hotels in Bragg Creek that are near tourist attractions? Expedia's large accommodation booking platform features 4 hotels within a 0.1-kilometre (0.1-mile) radius of Bragg Creek. 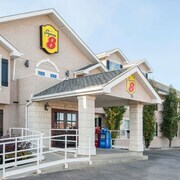 The Days Inn & Suites - Cochrane in Calgary is the closest accommodation, and sits 30 kilometres (19 miles) from downtown Bragg Creek. Also, check out the Super 8 Cochrane AB- West Side Drive, located in Calgary, which is 35 kilometres (22 miles) away. 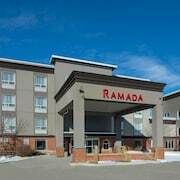 The Ramada Cochrane is 30 kilometres (19 miles) away from the center of Bragg Creek. The Bow River Inn is 30 kilometres (19 miles) distance away. Once you have seen the sights in Bragg Creek, ensure you allow time investigate more of Southern Alberta. Investigate Southern Alberta's old towns and admire the area's rivers. Adventurous travelers might also try snowboarding here. Calgary is 45 kilometres (28 miles) to the east of Bragg Creek, and is where you'll find the Calgary Tower and the University of Calgary. 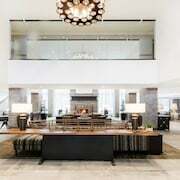 If you'd like to stay in Calgary, check out the room rates at the Hotel Le Germain Calgary and Kensington Riverside Inn. 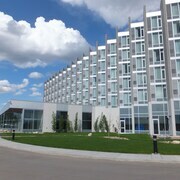 45 kilometres (28 miles) to the east of Bragg Creek is Downtown Calgary, which is home to the Hotel Elan and Best Western Plus Suites Downtown. If you're staying in Downtown Calgary, don't miss the BMO Centre and CORE Shopping Centre. As a substantial city in this area, Calgary South - MacLeod Trail has many shops and popular hotels, such as the Deerfoot Inn & Casino and Delta Hotels by Marriott Calgary South. The Deerfoot Casino and Historic St. Paul's Anglican Church are some of the points of interest in and around Calgary South - MacLeod Trail. Head 45 kilometres (28 miles) from Bragg Creek to reach Calgary South - MacLeod Trail. If you are really into sports and love watching local games, you might like to take a trip to Crowchild Twin Arena, which is 40 kilometres (25 miles) to the northeast of Bragg Creek. 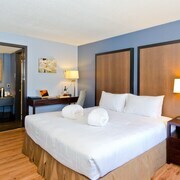 For visitors who are interested in sleeping close by, make a reservation at the Four Points by Sheraton Hotel & Suites Calgary West or Sandman Hotels & Suites Calgary West. Calgary International Airport is a logical airport for Bragg Creek travelers, and is 50 kilometres (31 miles) from Bragg Creek. Nearby hotels include Delta Hotels by Marriott Calgary Airport In-Terminal and Best Western Premier Freeport Inn & Suites. 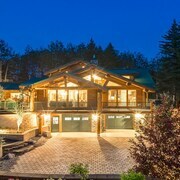 What are the most popular Bragg Creek hotels? 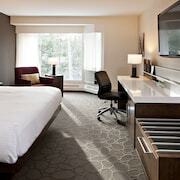 Are there hotels in other cities near Bragg Creek? 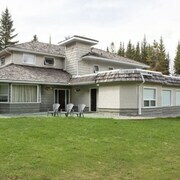 What other types of accommodations are available in Bragg Creek? Explore Bragg Creek with Expedia.ca’s Travel Guides to find the best flights, cars, holiday packages and more!